Subscribe today to begin your transformation into a more complete musical drummer. 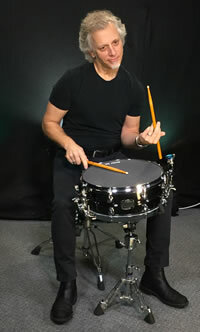 What is the Dave Weckl Online School? An Encyclopedia of Dave...fully updated and always evolving. Dave Weckl has spent a lifetime developing a sound and a style that has inspired drummers worldwide. Filmed in HD from multiple angles, with sound mixed by Dave, he uses the limitless space of the online environment to fully explain everything. Every nuance of technique, setup, musicality, tuning, and more, is presented and demonstrated as only Dave can do. And it's perfect for drummers of all ages and playing levels. Your membership includes our PRIVATE Facebook group where Dave, his staff, and Artist Relations professionals from Yamaha, Sabian, Vic Firth, and Remo, will participate. Upload your videos and exchange feedback with Dave and other members. We'll occasionally run webinars where you can interact with Dave in real time. Dave is including full play along packages that he sells on his Web site. You can download charts and minus-drum tracks to practice to and use for new recordings. He's also filming lessons with musicians such as Tom Kennedy, Mike Stern, Oz Noy, and Dom Famularo. And he's filming tunes and drum solos during all of his tours, which he bundles with a lesson "from the hotel," and gives to you. Dave's Affiliate Program pays teachers back for every student they bring in to the Online School. It's easy to get started, and all of the lessons in Dave's school provide endless material to work on with drummers of all ages. Teachers: once you sign up for the school, write to us to get things up and running. There are plenty of YouTube videos and other sites that teach "licks" and fragments of drumming concepts. Dave wants to immerse you in the foundation of great drumming by passing on his knowledge and experience - the concepts and tools that have helped make him one of the world's great drummers. Dave's full approach for developing matched and traditional grip techniques. Playing approaches for rock, funk, and jazz. Play with Brushes, Bundles, Hands, and More! It's easy! Just scroll down to "Get Started Now!" and choose monthly or annual billing. Annual billing saves you $5 per month. All courses and lessons are included in your membership. Some courses are labeled as "Coming Soon!" That means that we are in the process of producing that content and will we will post them in the very near future. You can help influence new material by leaving comments under lessons and posting in our private Facebook group! It's exclusive to Dave's Online School members! Does this Work on Portable Devices? Of course! Dave's school is powered by Teachable. Just download their app to access all the courses and lessons on your iOS devices. Or, enjoy it on your Mac or PC. Does Dave Really Participate in the Facebook Group and Lesson Comments? Yes, he really does! This is one of the main reasons Dave started the school: to get involved. While he can't comment on every post, he will comment on many, and we will alert him to important questions he misses. Start using the play alongs because if you post a video to the group, chances are that Dave will see it and he may have something to say! Full access billed monthly. Cancel at any time. Select this package to be billed monthly. You may cancel at any time. Completely secure. Save $5 per month by being billed annually. Sign up for this package if you would like to be billed annually. This package saves $5 per month, or $60 annually.